9.3% of Americans and 6.5% of Canadians suffer from diabetes. There is a lot of agreement about the medical treatment. But does the treatment work? At least 5 crucial studies have found that it doesn’t. People with type 2 diabetes are 2-4 times more likely to die from heart disease. But when the authoritative Cochrane group did a systematic review of 20 studies of type 2 diabetics, they found that there was no significant benefit to intensely targeting blood sugar control with drugs for either cardiovascular death or death from any cause. While it did reduce the risk of amputation, retinopathy and nephropathy, it also increased the risk of hypoglycaemia by 30% (Cochrane Database Syst Rev 2011 Jun 15;(6):CD008143). The same year, a meta-analysis of 13 controlled studies confirmed that there was no significant benefit of drug treatment for cardiovascular death or death from any cause. While at first it looked like drugs may reduce the risk of nonfatal heart attacks, when only the high quality studies were included, that apparent benefit disappeared; however, what now appeared was a 47% increase in the risk of congestive heart failure. So, diabetes drugs did not reduce the risk of death from heart disease, they increased them. They also doubled the risk of severe hypoglycaemia (BMJ 2011 Jul 26;343:d4169). A third systematic review and meta-analysis included 14 studies of type 2 diabetics. Its negative findings went even further. Not only did diabetes meds confer no benefit for fatal or nonfatal heart attack or stroke nor for death from any cause, this study also found insufficient evidence of reduced risk of retinopathy or nephropathy. This study also found a 30% increased risk of severe hypoglycaemia (BMJ 2011;343:d6898). And if you’re wondering why 3 studies published in 2011 that showed little or no benefit, but significant risk, of using diabetes drugs didn’t send tremors through the medical community, it wasn’t even news. Three years earlier, the ACCORD study of 10,251 type 2 diabetics who were at high risk of heart attack or stroke found that intensively targeting blood sugar reductions with drugs did not significantly reduce the risk of major cardiovascular events like fatal or nonfatal heart attack or stroke. Shockingly, it did find that diabetes drugs increase the risk of death from any cause by 22% and from cardiovascular disease by 35% (NEJM2008; 358:2545-2559). Researchers at the Mayo Clinic compared the research published in the top journals between 2006 and 2015 to the recommendations made in medical guidelines. They included all the meta-analyses and systematic reviews of randomized trials. What they found was surprising and disturbing. Though most published statements (77%-100%) and guidelines (95%) still “unequivocally endorsed” medical glycemic control, the evidence from the actual research found “no significant impact” of the medical approach. 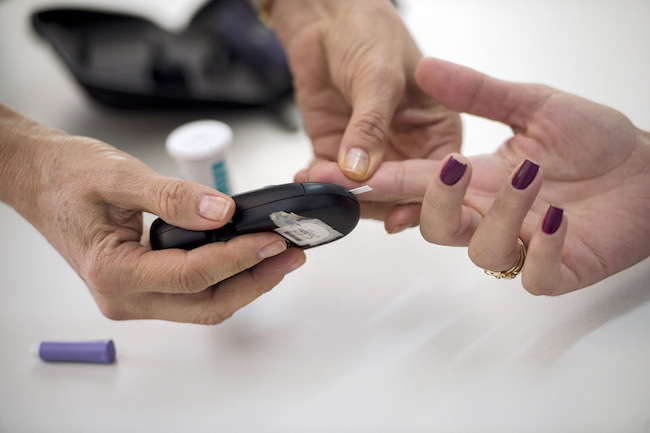 Controlling blood sugar by the medical approach did not significantly improve the risk of complications due to diabetes, including dialysis, kidney transplant, renal death, blindness or neuropathy. As far as the cardiovascular risks associated with diabetes, though there was a 15% improvement in risk of nonfatal heart attack, there was no significant benefit for all-cause mortality, cardiovascular mortality or stroke. The researchers concluded that there is a great “discordance” between the actual evidence based on research and the recommendations made supposedly based on that research (Circ Cardiovasc Qual Outcomes 2016,doi: 10.1161/ CIRCOUTCOMES.116.002901). High fiber diets work better than the American Diabetic Association diet and as well as drugs (NEJM 2000;342:1392-98). Fiber supplements are also effective (Am J Clin Nutr 1999;70:466-73; J Diab Comp 1998;12:273-78; J Ethnopharmacol 2005;102:202-7; Eur J Clin Nutr 2002;56:830-42; Am J Clin Nutr 1992;56:1061-65; Am J Clin Nutr 1988;48:1413-17; Am J Clin Nutr 1995;61:379-84). A meta-analysis of 35 controlled studies of type 2 diabetics found that supplementing psyllium significantly improves fasting glucose and HbA1c, which is the best measure of long term blood sugar and diabetes control (Am J Clin Nutr2015;doi:10.3945/ajcn.115.106989). A vegan diet is more effective than the American Dietetic Association diet and as effective as drugs (Diabetes Care 2006;29:1777-83). Increasing red meat by only half a serving a day increases the risk of diabetes by 48%; deceasing it by half a serving a day decreases the risk by 14% (JAMA Intern Med 2013;173:1328-35). Vegetables, fruit, nuts, seeds, legumes, garlic and onions are beneficial (J Clin Epidemiol1999;52:329- 35; Diabetes Care 2012;35:1293-300; Diabetes Care 2008;31:1777-82; J Nutr2013;143:512-8). People who get the most anthocyanin flavonoids in their diet (like those found in blueberries) are 15% less likely to develop type 2 diabetes, and eating a lot of blueberries, apples or pears reduces the risk of diabetes by 23% (Am J Clin Nutr2012;95:925-33). People with flavonoid rich diets are 9% less likely to develop type 2 diabetes (Clin Nutr 2014;33:59-63). The most important nutrient for diabetes is chromium. Chromium is proven to help diabetes (Am J Clin Nutr 1991;54:909-16; J Nutr 1993;123:626- 33; Diabetes 1997;46:1786-91). In probably the most important study on chromium, type 2 diabetics who were already on the drug glipizide were also put on 500mcg of chromium or placebo twice a day for 10 months. The chromium significantly improved insulin sensitivity compared to the placebo and led to less weight gain and less diabetes-caused tissue damage (Diabetes Care 2006;29:1826-32). When overweight people whose meds were failing to control their diabetes added 600mcg of chromium and 2mg of biotin in a placebo-controlled study, their blood glucose dropped a significant additional 6% and their HbA1c improved significantly (Diabetes Metab Res Rev2008;24:41-51). People whose medication was not adequately controlling their type 2 diabetes added a placebo or 600mcg of chromium for 4 months. The chromium group had significantly better improvements in blood sugar and HbA1C (J Trace Elem Med Biol2015;32:66-72). Deficiencies in zinc contribute to the development of diabetes (Am J Clin Nutr 1987;45:877-95), and supplementing zinc improves diabetes (J Assoc Physicians India 1987;35:52). 365mg a day of magnesium improves blood sugar levels in people who are at risk of diabetes (Diabetes Obes Metab 2011;13:281-4), and magnesium improves insulin production in elderly type 2 diabetics (Diabetes Care 1989;12:265-69). In the most recent magnesium study, a systematic review and meta-analysis of 25 studies that included 637,922 people found that more magnesium in the diet resulted in a 17% reduction in the risk of diabetes. There was a significant dose dependent relationship: every 100mg increase a day of magnesium resulted in an 8-13% decrease in the risk of type 2 diabetes (Nutrients 2016;8(11)). People with the highest blood levels of vitamin C are 62% less likely to become diabetic (Arch Intern Med 2008;168:1493-9). 70 type 2 diabetics were given the diabetes drug metformin plus either 500mg of vitamin C or a placebo twice a day for 12 weeks. Compared to the placebo, vitamin C significantly improved fasting and postmeal blood glucose levels, and significantly decreased HbA1c (Adv Pharm Sci 2011;doi:10.1155/2011/195271). Low levels of vitamin D are associated with insulin resistance and less ability of the pancreas to secrete insulin (Am J Clin Nutr 2004;79:820-25). People who get the most betacarotene in their diet have a significant 22% reduced risk of diabetes. People who get the most alphacarotene reduce their risk by a significant 15% (NMCD2015;25:376-81). Coenzyme Q10 improves blood glucose and insulin synthesis (Med Hypotheses 1999;52:397- 400). Lipoic acid significantly improves insulin sensitivity (Free Radic Biol Med 1999;27:309-14) and is the most important nutrient for diabetic neuropathy. Placebo-controlled research shows that 1-6g of cinnamon reduces serum glucose in type 2 diabetics (Diabetes Care 2003;26:3215-8). A double-blind study showed that 360mg of cinnamon extract significantly improves blood glucose and HbA1c in type 2 diabetics who are already being treated with the drug gliclazide (Nutr Res 2012;32:408-12). Other studies have also found that cinnamon reduces blood sugar (Am J Clin Nutr 2007;85:1552-6; Eur J Clin Invest 2006;36:340-4). 2 meta-analyses of the controlled research on cinnamon show that its reduction in blood glucose is comparable to the drug metformin and that it significantly reduces HbA1c when it is taken as a capsule (J Med Food 2011;14:884-9; Ann Fam Med2013;11:452-59). 15-25g of powdered fenugreek seed has been shown to significantly lower blood sugar(Eur J Clin Nutr 1988;42:51-4; Nutr Res 1996;16:1131-9). When type 2 diabetics not successfully managed by the drug sulfonylureas added fenugreek saponins or placebo, there was a significant drop in blood sugar levels, symptom scores and other important markers of diabetes in the fenugreek group compared to the placebo group (Chin J Integr Med2008;14:56-60). Fenugreek actually prevents the progression from prediabetes to diabetes. Significantly fewer people given 5g of fenugreek powder twice a day for 3 years progress to type 2 diabetes: a control group had a 4.2 times higher chance of developing diabetes than the fenugreek group. The people who took fenugreek had significantly greater reductions in fasting glucose and after eating glucose as well as in LDL cholesterol. They also had significantly greater increases in serum insulin (J Diabetes Metab Disord 2015;14:74). Double-blind research shows that adding 300mg of garlic 3 times a day to metformin significantly drops blood sugar by 3.12%. When a placebo was added to the drug instead, the drop was only 1.78% (Pak J Pharm Sci 2011;24:565-70). In an 8 week, double-blind study, type 2 diabetics were given either 3g of ginger powder or placebo. Fasting blood glucose went down by 10.5% on ginger; it went up by 21% on placebo. The ginger also significantly improved measures of insulin resistance (Comp Ther Res2014;22:9-16). When type 2 diabetics who were on medication added 3g of ginger or placebo for 3 months, the ginger was significantly better at improving serum glucose, insulin, insulin resistance, HbA1C, measures of free radical damage and inflammation (J Compliment Integr Med 2015;12:165-70). When type 2 diabetics were given 100ml of fresh bitter melon, 73% of them improved significantly (J Ethnopharmacol 1986;17:277-82). 100ml of bitter melon extract has been shown to drop blood sugar by 54% in 3 weeks (Phytother Res 1993;7:285–9). When 4g a day of bitter melon was compared to the drug glibenclamide in a double-blind study of type 2 diabetics, HbA1c dropped significantly in both groups and the herb was as good as the drug. Though fasting plasma glucose decreased significantly in both groups, the decrease was greater on the herb. After an oral glucose tolerance test, plasma glucose levels went down significantly only in the drug group. The dangerous LDL cholesterol dropped significantly only in the bitter melon group, and, while the heart healthy HDL cholesterol went up slightly on bitter melon, it went down slightly on glibenclamide group. Bitter melon also significantly lowered triglycerides. Systolic blood pressure dropped significantly on the herb but not on the drug. Body weight also improved in the herb group while worsening in the drug group (Nutr J2015;14:13). The herb Gymnema sylvestre lowers blood sugar and improves blood sugar control (J Ethnopharmacol 1990;30:281-94). Type 2 diabetics who add gymnema to their medication have significant improvement in blood sugar control (J Ethnopharmacol 1990;30:295-30). 500mg of berberine taken 3 times a day is as effective as metformin at improving blood sugar, HbA1c and insulin, with the advantage that it also lowers cholesterol and triglycerides. When drugs are not successfully managing type 2 diabetes, adding berberine significantly improves blood sugar, HbA1c, cholesterol and triglycerides (Metabolism 2008;57:712-17). Berberine is as effective as the drugs metformin and rosiglitazone for managing type 2 diabetes (Metabolism 2010;59:285-92). A meta-analysis of controlled studies found that, for type 2 diabetes, berberine is more effective than placebo and as effective as drugs and that adding it to drugs is superior to drugs alone (J Ethnopharmacol 2015;161:69-81). In perhaps the most amazing diabetes study, 237 prediabetics were given either curcumin(containing 750mg curcuminoids) or placebo twice a day for 9 months in a double-blind study. 16.4% of prediabetics on placebo went on to develop type 2 diabetes. 0% of those on curcumin did! The curcumin group had significantly better insulin producing beta-cell function and significantly less insulin resistance. So curcumin may actually stop the development of diabetes (Diabetes Care 2012;35:2121-7). A review of the literature on curcumin and diabetes/ prediabetes shows that curcumin lowers glucose and improves beta cell function (Int J Endocrinol Metab 2014; 12: e18081). 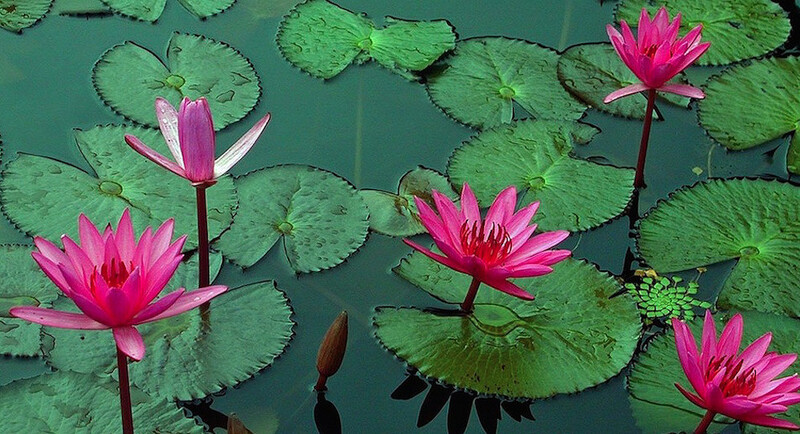 When a double-blind study gave either a placebo or 2,500mg tablets of aloe vera gel extract to pre-diabetics for 8 weeks, fasting blood glucose and HbA1c decreased significantly in the aloe group and significantly better than in the placebo group. Total cholesterol as well as the dangerous LDL cholesterol and triglycerides decreased significantly in the aloe group, and the heart healthy HDL cholesterol went up significantly in the aloe group. All of these benefits were significantly greater on aloe than on placebo (J Diabetes Metab Disord 2015;14:22). A systematic review and meta-analysis included 8 controlled studies of aloe vera on diabetes or prediabetes. When only the 5 high quality studied were included, it found that aloe vera significantly reduced fasting glucose levels in prediabetics and significantly decreased HbA1c in diabetics (J Clin Pharm Ther 2016;41:180-188). A second systematic review and meta-analysis of 5 controlled studies also found that aloe signifciantly reduces fasing blood glucose and HbA1c. It also significantly lowered triglycerides, total cholesterol and LDL cholesterol while significantly increasing HDL cholesterol (Nutrients 2016;8(7)). A meta-analysis of 17 controlled studies of green tea including 1,133 people who were healthy weight, overweight, diabetic or prediabetic found that green tea significantly reduced glucose and insulin levels. It also showed that green tea lowered HbA1c (Am J Clin Nutr2013;doi:10.3945/ ajcn.112.052746). A double-blind study found that 160mg of anthocyanins taken twice a day reduces blood sugar and insulin resistance in diabetics (J Nutr 2015.doi:10.3945/jn.114.205674). 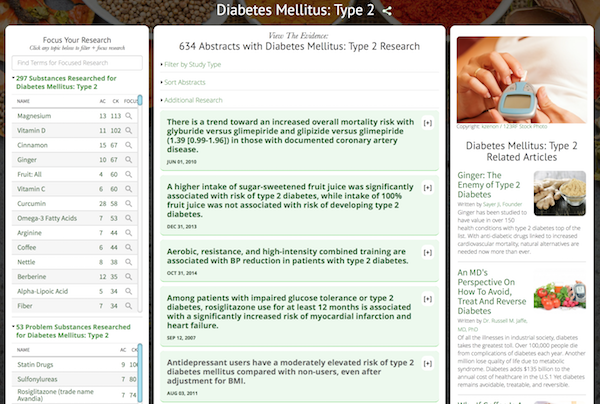 For evidence-based research on natural interventions to prevent and treat type 2 diabetes, visit the GreenMedInfo.com Research Dashboard. This entry was posted in Uncategorized on December 14, 2016 by The Health Coach.